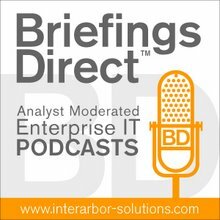 The next BriefingsDirect DevOps thought leadership discussion explores how continuous processes around the development and deployment of applications are both impacted by -- and a benefit to -- the Internet of Things (IoT) trend. Listen to the podcast. Find it on iTunes. Get the mobile app. Read a full transcript or download a copy. Watch for Free: DevOps, Catalyst of the Agile Enterprise. To help better understand the relationship between DevOps and a plethora of new end-devices and data please welcome Gary Gruver, consultant, author and a former IT executive who has led many large-scale IT transformation projects, and John Jeremiah, Technology Evangelist at Hewlett Packard Enterprise (HPE), on Twitter at @j_jeremiah. The discussion is moderated by me, Dana Gardner, Principal Analyst at Interarbor Solutions. Gardner: Let’s talk about how the DevOps trend extends not to just traditional enterprise IT and software applications, but to a much larger set of applications -- those in the embedded space, mobile, and end-devices of all sorts. Gary, why is DevOps even more important when you have so many different moving parts as we expect with the IoT? When you're enabling people to go off and work on separate branches and separate issues and you have an integration cycle late in the process, that’s where you get the dysfunction -- with a bunch of different organizations coming together with stuff that doesn’t work. If you force that to happen on a daily, or multiple times a day, basis, you get that system aligned and working well before people spend time and energy working on something that either don’t work together or won’t work well in production. Listen to the podcast. Find it on iTunes. Get the mobile app. Read a full transcript or download a copy. Watch for Free: DevOps, Catalyst of the Agile Enterprise. Sponsor: Hewlett Packard Enterprise.